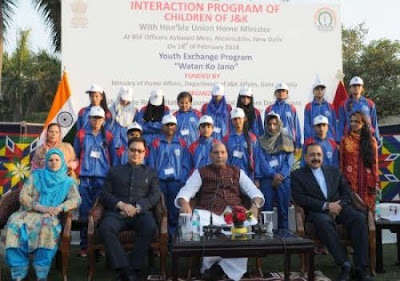 With an aim to give exposure to the youth and children of Jammu and Kashmir, the Ministry of Home Affairs has launched "Watan ko Jano" programme. The programmer started on 11th of February too around 200 youth on a visit to different places of the country as part of the programme to make them aware of the cultural and socio-economic development taking place in other parts of the country. The children have visited Ajmer, Jaipur and Agra and the historical places in Delhi. With this tour, the youth will be able to see the development of modern India. The youth have certain responsibilities towards nation when they grow up and they should take interest in education, respect elders and do something that will make their parents and country proud. "Unity in diversity is the unique value of the country and these children are also a reflection of it. With this tour, the youths will be able to see the development of modern India,"
1. Ministry of Home Affairs has launched "Watan ko Jano" programme with an aim to give exposure to the youth and children of which of the following states by taking them on a nation-wide tour? Watan ko Jano programmer has been launched by which of the following ministries of India?